"One such angel is Stacie Doorek, author of Chair Yoga, and a new book recently released, Yoga for Everyone. "Bordon was motivated to start the chair yoga class at Buckingham Pavilion after taking course training from Stacie Dooreck in Florida. Dooreck is a Sivananda Certified, Kundalini Yoga Instructor. 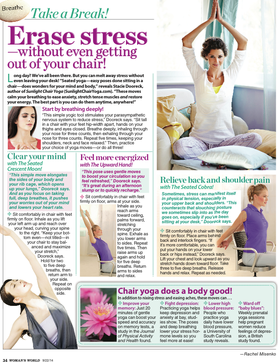 Dooreck started chair yoga as a need to heal, and rehabilitate herself from Lyme Disease. Bordon believes everyone is capable of doing some form of yoga regardless of age or physical limitation." Read it here. 11/11/07 CAT AND COW POSE: Marjaryasana and Bitilasana in Sanskrit. Explained and modeled by Stacie Dooreck of Sunlight Yoga, where she teaches yoga classes and private sessions. A lifelong student of yoga, Dooreck became a Sivananda International Certified Yoga Instructor in 1995. She has studied with many yoga masters, including B.K.S Iyengar. For more information visit her Web site, sunlightyoga.com. BENEFITS: Cat and cow poses help establish spinal alignment and strengthen and stretch core and back muscles. The combination may also help relieve back pain. Practiced regularly the cat and cow combination develops coordination of spinal movement and balance. WHO SHOULDN’T DO IT: Cat and cow poses are accessible to most people. Women in late pregnancy may want to avoid the pose. People with neck injuries may feel more comfortable keeping their head in line with their torsos. HOW TO DO IT: Begin in table pose with hands and knees on the ground. Extend fingers and even the weight between hands and fingertips. Hands are under the shoulders and knees are under the hips. Head is relaxed, moving with the breath. Inhale for cow pose with the belly toward the earth and head, heart and tailbone rising. Exhale to cat pose pulling the belly toward the spine and round or arch the back. Practice moving between for the poses for three or six rounds. End with child’s pose. Sit back on the heels, while extending the torso and arms forward on the floor. Enjoy some slow deep breaths MODIFICATIONS: If spreading the fingers and pressing the palms into the earth is uncomfortable, practice the poses on fists to protect wrists.